This item from the long-running National Film Unit series tails cats and feline lovers. 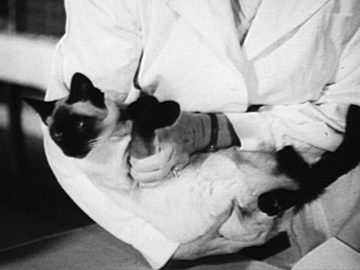 The humorous clip from 1956 begins in a woman's bedroom at 6am; the devoted cat owner preens herself and her Siamese cat, in preparation for the Auckland Champion Cat Show. Felines are examined at Auckland's Town Hall for diseases, since "an outbreak of ringworm would be a cat-astrophe"; and a judge dressed in her Sunday best checks over animals before kitty lovers are let into the hall. The Pictorial Parade series began in 1952. In its early years, each Parade consisted of multiple items.